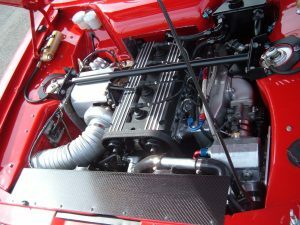 This engine is considerably different to the 500/600bhp units. It has a further reduction in compression ratio using forged pistons, NMS designed Farndon H Section con-rods, and a NMS specification Farndon crankshaft. We offer a choice of capacities depending upon rpm band required. The smallest unit is a short stroke 1.9 unit as used in our Sunbeam race car, and this engine has a safe maximum rpm of 10,000rpm. Alternatively we can run the engine as a 2000cc unit with 9200rpm maximum rpm, or a longer stroke 2.2 unit with a 8500rpm maximum. All engines are rated for 700bhp. The cylinder head is ported further with larger inlet and exhaust ports, and 1mm oversize valves are used on std valve seat inserts opened to their safe maximum ID. Longer duration, higher lift solid lifter cams replace the items used in the 600bhp engine. New inlet and exhaust manifolds are used and either a Garrett HTA35, GT3788r or Precision PT6262 are used in external wastegate form. Dry sumping is advised at these rpms, but we can build suitable wet sump designs that incorporate a specially designed breather system, if you don’t have space for the extra plumbing associated with the dry sump system.